The following legend starts with Matsudaira Gozaemon Chikamasa (松平五左衛門近正, 1547-1600), the elder (karō, 家老) of the Ogyū branch (大給) of the Matsudaira family. The Ogyū branch was founded by Chikamasa´s great-grandfather Matsudaira Norimoto (松平乗元, 1446-1537) when he took over the Ogyū fief of the same name in Kamo district (加茂) of Mikawa province. It is said when Tokugawa Ieyasu´s retainer Ishikawa Kazumasa (石川数正, 1533-1593) deserted to Toyotomi Hideyoshi, the latter had suggested that Chikamasa should change sides too, but he refused and remained loyal to Ieyasu. In Tenshō ten (1590) Chikamasa followed Ieyasu when the latter marched with troops of Hideyoshi to the Kantō area to overthrow the Hōjō clan. Hideyoshi offered Ieyasu that he could have all lands of the defeated Hōjō whereupon he agreed and stayed in Kantō. In this course, Chikamasa was entrusted with the Sannokura fief (三蔵) in Kōzuke province with an income of 5.500 koku accompanied by the permission to establish his own family branch of the Ogyū-Matsudaira. We are somewhere between the 18th year of Tenshō (1590) and the Battle of Sekigahara when the wife of a friend of Chikamasa whose details are not transmitted died. Chikamasa accompanied the funeral procession when suddenly literally out of the blue a terrible thunder-storm came up. Lightnings stroke to the side of the procession which did not know which way to turn so shocked by the strong winds and the torrential rain. A very dark cloud moved exactly above the coffin and a weird arm came out of her, trying to pull the coffin into the sky. Chikamasa acted intuitively, drew his sword with a loud combat cry and severed the arm of the unknown thing. The arm was on the spot inspected: It was coated with black fur and three pointed claws which shimmered like celadon. The participants of the funeral procession were astounded but agreed that it must be the arm of a kasha (火車 or 化車). A kasha is a monster which is known to came down from the sky accompanied by blazing flames to grasp the bodies of those who were bad shortly before their death or lived a depraved life. Unfortunately it is not transmitted what the wife of Chikamasa´s fried did to evoke a kasha. 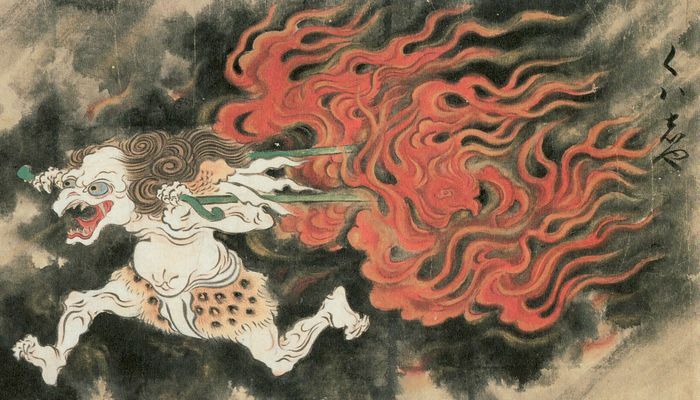 The picture below shows a picture of that monster, drawn by Sawaki Sōshi (佐脇嵩之, 1707-1722) and published in Genbun two Genbun (元文, 1737) in his “Monster Encylopedia” or “Bestiary” called Hyakkai Zukan (百怪図巻). Kasha from the Hyakkai Zukan. Please note the old pronunciation or quotation kuhasha or kwasha (くハ知や) respectively to the right side of the painting. “What a sharp sword,” noted one of those standing close to Chikamasa when he severed the arm of the kasha, and Chikamasa replied: “A work of Fujishima Tomoshige (藤島友重)!” And on the basis of this incident the blade got the nickname Kashakiri-Tomoshige (火斬り友重). The first generation Tomoshige was active from the end of the Kamakura to the early Nanbokuchō period. He lived in Fujishima in Echizen province and there are two theories regarding his career as swordsmith. The first says that he studied under Sanekage (真景) *1 who lived in the neighboring province of Kaga and who was for his paret a student of Norishige. The second theory which was already published in the sword publication Tenshō Bon Mei Zukushi (天正本銘尽) from the Tenshō era (1573-1592) says that he was a student of Rai Kunitoshi who was introduced in chapter 13 (the smith who made the Hotarumaru). But dated blades of Tomoshige are only found from the Ōei era (応永, 1394-1428) and successive generations were active until the middle Edo period. Some time after the “coffin incident,” Chikamasa´s daughter was married to Suwa Yorio (諏訪頼雄, ?-1631), the younger brother of Yorimizus (頼水, 1571-1641) who in turn was Lord of Suwa Castle (諏訪城) in Shinano province. Like in the case of Chikamasa, parts of the Suwa family followed Ieyasu to the Kantō area and stayed there. In the course of the wedding the Kashakiri-Tomoshige and a claw of the severad arm were granted by the father-in-law Chikamasa to his son-in-law Yorio. The story was of course also known by Yorimizu who ordered his younger brother to leave it to him. Yorimizu on the other hand inherited it – without claw – to his second son Yorisato (頼郷, 1597-1669) who was in the council of elders of Tokugawa Tsunashige (徳川綱重, 1644-1678), the older brother of the fifth Tokugawa-shōgun Tsunayoshi. This provenience of the Kashakiri-Tomoshige is to be found in the chronicle Kashakiri Tō no Ki (火車斬刀之記) written by Yorisato´s son Yorioto (頼音) in the third year of Enpō (延宝, 1675) but which is somewhat inaccurate. For example, Chikamasa is quoted with the characters (近政) instead of (近正) which are consistently published in all official family registers of the bakufu like the Kansei Chōshū Shokafu (寛政重修諸家譜). And according to the latter work, Chikamasa had two daughters but none of them were married to Suwa Yorio. On the other hand, the third daughter of Chikamasa´s grandson Narishige (成重, 1594-1633) married into the Suwa family. However, after Yorioto the Suwa family split into two lines and it is not transmitted in which line the Kashakiri-Tomoshige was handed down. In this story we have head about Kagekatsus list of his 35 best treasure swords Kagekatsu Kō Ote Erabi Sanjūgo Koshi (景勝公 御手選三十五腰). Some sources say that this list contained 36 swords, inspired by the so-called “Thiry-six Poetry Immortals” (sanjūrokkasen, 三十六歌仙) selected by the Heian-period poet and courtier Fujiwara no Kintō (藤原公任, 966-1041). Whether 35 or 36, Kagekatsu´s list contains a blade called Kashakiri. It is a wakizashi of Sōshū Hiromitsu (相州広光, see picture below) but the exact backgrounds in which way this blade came to its nickname are not noted in this work. The blade in question was designated in 1933 – together with its chiisagatana-koshirae (小サ刀)*2 from the late Muromachi period made on orders of the Uesugi family – as jūyō-bijutsuhin, submitted by baron Uesugi Noriaki (上杉憲章), the then head of the family. Whe can speculate about the name of the Uesugi Kashakiri inasmuch as there was one very brave vassal of the Takeda family who bore the nickname Kashakiri. This vassal was Tada Mitsuyori (多田満頼, 1501-1563) who served Takeda Shingen and his father Nobutora (武田信虎, 1494-1574). Incidentally, Mitsuyori was a descendant of Minamoto no Yorimitsu who dealt with the demon Shutendōji. Mitsuyori´s third son Kyūzō (久蔵) went into the Battle of Nagashine in Tenshō three (1575) under the command of Shingen´s son Katsuyori (勝頼, 1546-1582). This battle was a turning point in Japanese warfare because Oda Nobunaga applied for the first time the arquebus in large numbers which was introduced to Japan forty years earlier. Nagashine meant a crushing defeat for the Takeda but Katsuyori was able to escape with six men, among them Kyūzō. So it is possible that the blade of Hiromitsu mentioned in the Kagekatsu Kō Ote Erabi Sanjūgo Koshi was once in the possession of Kyūzō and further, that he inherited it from his father Mitsuyori who – according to legend – killed a kasha at a certain funeral. When we now let our mind wander, we could assume that Kyūzō handed over the blade to Takeda Katsuyori before he escaped from the battlefield because it is unlikely that he carelessly discarded it together with his armor. And Katsuyori´s stepsister Kikuhime (菊姫, 1563-1604) married in Tenshō seven (1579) Uesugi Kagekatsu. So maybe the Kashakiri by Sōshū Hiromitsu was a wedding present of Katsuyori to Kagekatsu? *1 Well, other records say that it was the second generation who went from Fujishima to Kaga to become a student of Sanekage. *2 Lit. “small katana.” A short wakizashi which is – unlike a koshigatana – mounted with a tsuba like an uchigatana. This is so-to-speak a hybrid form between a koshigatana or the later tantō and an uchigatana.